It's no secret that I love fun, playful skirts, especially those that have a little bit of an artistic touch, such as bold brushstrokes. When I found this one online at H&M I was sold. Unfortunately for me, I forgot about the extra 40% off coupon the store mailed me months earlier that actually would have still been good on the skirt. As I was cleaning up some items and looking at old mail I found the coupon, but alas it was too late. I definitely could stand to be more organized! The second unfortunate incident was that I ordered the wrong size in the skirt. H&M's sizing mystifies me. I know that they run a little small, but some things seem to run really, really small. Between J. Crew's vanity sizing and H&M's tiny sizes, it's hard to know exactly what your true size is. I think for skirts my true size is probably a 4, but in this particular skirt I needed to size up to an 8. H&M does not allow you to return online purchases in store, which seems absurd to me. I found out that this policy is due to the codes and numbers used to identify merchandise being different in-store and online, but I was assured by a sales associate that the brand is coming close to reconciling this inconvenience. (Why didn't they consider this before?) Anyway, sometimes I feel these little incidents are telling me that I may have one too many skirts! But how can you ever have too many skirts? Thank you! 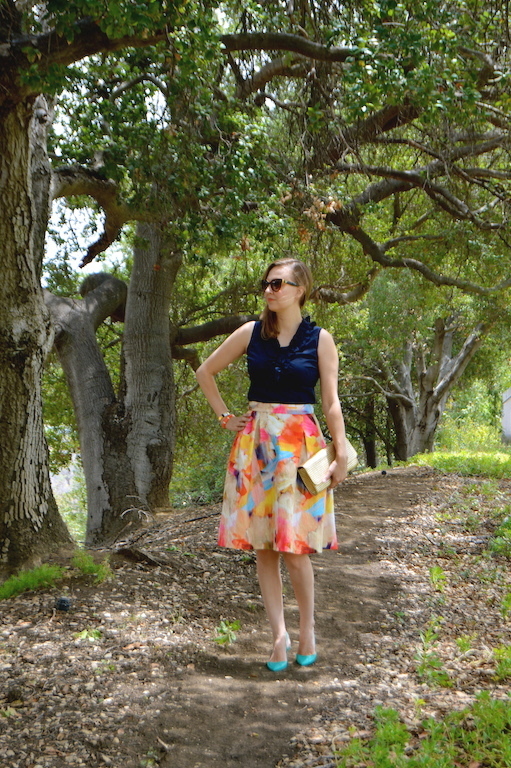 I wasn't sure what to pair the skirt with, but I am glad I went with navy blue! Hope you're having a fantastic weekend too! Thank you! I am always fond of a colorful, vibrant print! Have a nice weekend! Thank you so much for following along with me! I returned the favor by following you back! Love your style blog! You always look so chic and feminine! Thanks for supporting Fun Fashion Friday! Thank you Dawn! I really appreciate you hosting the link up as always! What a pretty skirt! I can totally see why you feel for it. Thank you Amy! It was a great find at H&M! That skirt is absolutely gorgeous! I want one! The sizing issue frustrates me too. Sizes should be universal, not store by store. Have you ever been to a Chico's? They are the most ridiculous of all. A 000 in Chicos is about a size 8. It's vanity sizing taking to the extreme! They still have them online and in stores if you want to pick one up! I have never shopped at Chico's but it does sound like extreme vanity sizing! I once bought a dress at LOFT in a petite xxs and it was still too big. I am not sure why retailers do this .... it's supposed to be flattering, but it's mainly frustrating! Bummer that you missed your coupon (that has happened to me before). I am always confused about H&M sizing as well and can't seem to figure out which size I wear. 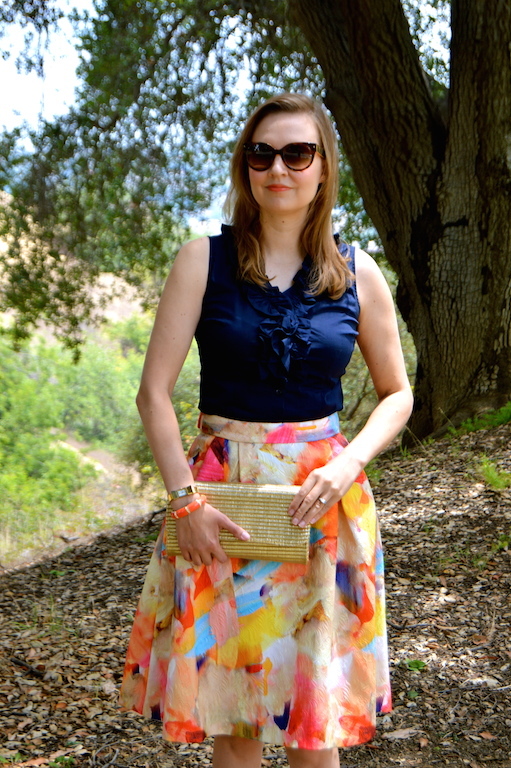 This skirt is gorgeous and looks fab on you! I have sort of stopped shopping online at H&M because of their lame return policy. I agree that the odd sizing and return policy really does discourage shoppers from buying online from H&M. Thanks for hosting every week! I'm so behind on catching up on my blogs and I've been meaning to comment on your post. First, you can never have too many skirts. Second, you absolutely had to buy that skirt. It's not just the fact that it looks like an abstract watercolour painting (which is stunning) but that the skirt has a textured pattern to it as well! Love the fact that you've worn navy on top and then the vivid blue with the shoes. Sizing in the UK drives me nuts too. I can be anything from a UK size 8 up to a UK size 14! But it's not as if I deflate and then suddenly expand! I also love the textured pattern on the skirt, it makes it very unique. I had to laugh at your comment about deflating and then expanding! Sometimes the crazy sizing makes me feel like I spontaneously do this on a daily basis! Don't even get me started on UK sizing. That just makes everything all the more confusing!